I would even resist eating these kind of fried stuff to treat myself with pastries. But.. But for this mysore bonda!! This fritter is simply irresistible and too tasty to avoid. We also call it Medhu pakoda or Patnam pakado. Beat vanaspathi and cooking soda on a plate. Chop chillies, cashews, onion and curry leaves and add them to the vanaspathi mixture. Mix in the rice flour, roasted gram flour and salt until it forms crumbs. Add water little by little and mix it to make soft dough. Do not kneed the dough too much. Pinch small portions of the dough and roll it into balls and deep fry in low flame until it turns golden brown and well cooked. Yummy Mysore bonda is ready to eat. Do not mix the entire mixture into dough at one stretch. Doing that would lead to change of color of the dough when left alone for a long time. So divide it into portions and make the mixture into dough by adding water as and when required. Supera irukku nithi but we call this as Patnam pakoda and the mysore bonda which I do is Apf+rice flour + butter milk. Balls in baskets looks cute. :) Anni- Amma calls the one you have said as Mangalore bonda. But not sure which is the right name. :) Mom agreed to the name patnam pakoda. Your bondas looks very cute in those little baskets. 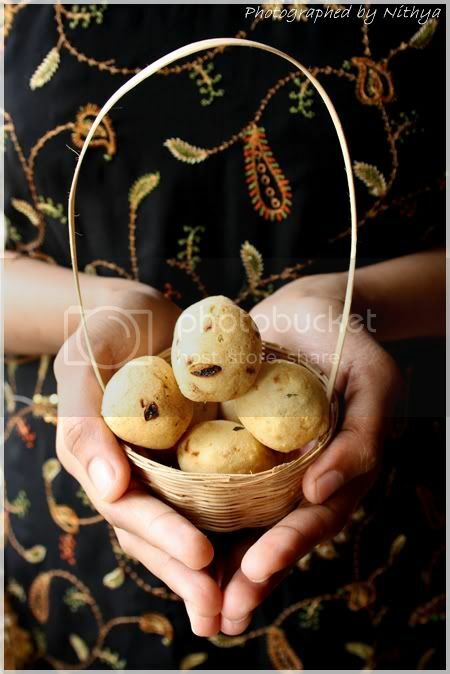 I love the pic and the bonda looks yumm. 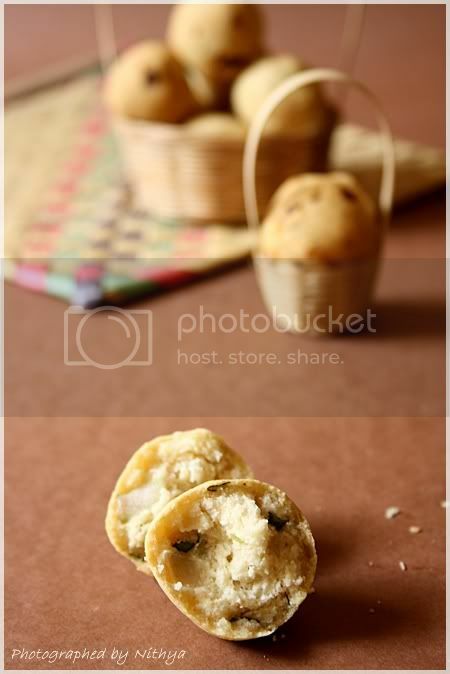 I am awed by ur pics and cant stop ogling at them.. LOve these bonda.. Will love it with a cup of tea! 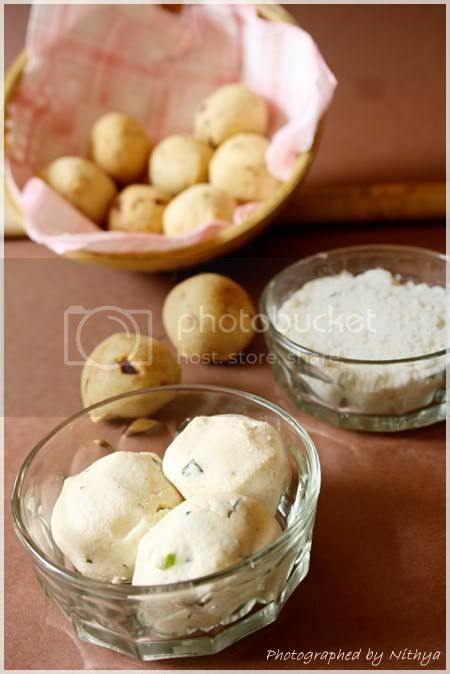 Delicious Bonda & lovely pics!! I agree with Pavithra we too call this Patnam pakoda any way they looka so so tempting. Your bondas look lovely - I believe we call these "medhu Pakodas" - And mysore bondda are the urad bondas - But what's in a name? A bonda or pakoda still tastes great :))-- A fine blog, you have here- I think my first time here. 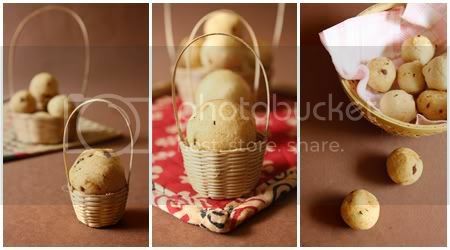 Crispy beauties looks super delicious and awesome...Lovely baskets..
Fluffy and yummy bondas,beautiful cute presentation in those little baskets. Potato bonda ku ulla potato irrukum, aana Mysore bonda ku ulla Mysore irrukathu !! Mysore iruku illayo, kandipa class taste irrukum from your kitchen ;-) sooper ! Bondas look cute and delicious,love those adorable baskets. love the recipe of mysore bonda, we make it in a different way. I can take that basket from you - if its heavy. if not too. 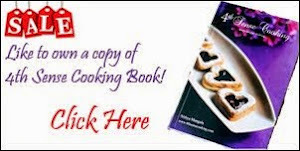 Wow,this is a new recipe to me.I love Mysore Bondas too and always order them at Sangeetha and absolutely adore it--it satisfies my cravings and I don't have to worry about consuming more than I want to! !I have come across a different recipe which uses the same batter for Medhu Vada but is fried in small balls shape.Any which way--Mysore Bonda is a class act!! I just saw the comment section--again,Mangalare Bonda or Goli baje[as it is originally called] is made using Maida and Buttermilk and sometimes Urad dal paste is added too.Just goes on to show how dishes take a different turn at the makers hands!! Looks fabulous.. 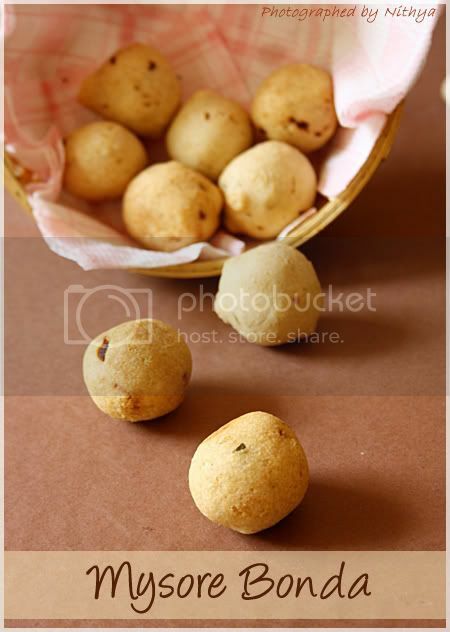 This is called as mangalore bonda... and we make mysore bonda in a different way. 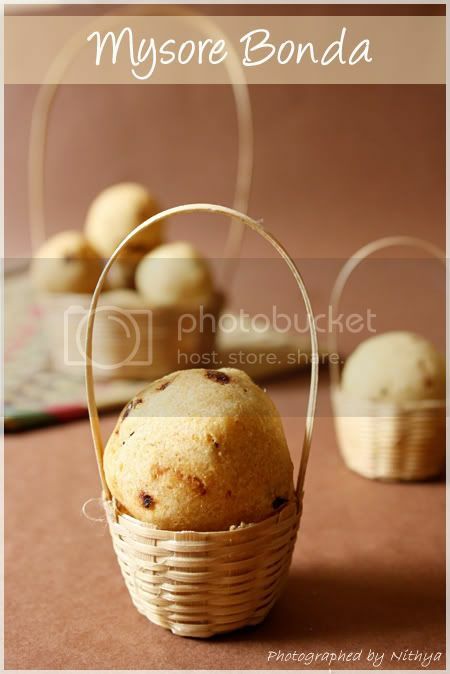 Lovely bonda in cute bascket!!! Delicious bondas and as usual, great snaps.. Perfect looking Mysore bondas, Nits!!! :)..pretty pretty shots!!!! abt the picture posts, its all jst to push myself to do some blogging..this was a food post and a pic post will be alternated, u see :) lest I'll get back to my burrow and hibernate..
P.S- I was in fact getting in and out thrice a day to check ur comments..somehow i wanted it sooo badly and thought of u when I uploaded the pic, i swear! !...donno why!!! Nice pic of the Mysore Bondas. looking yum and delicious. Tried your Mysore Bonda recipe out and they turned out really well. Gonna try this recipe! Thank you for sharing!